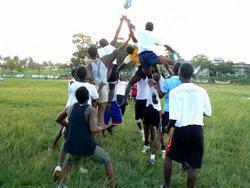 Rugby in Ghana is an emerging sport, with many Ghanaians now discovering its attractions. It is a sport well suited to Ghana as it combines athleticism, awareness and speed - all of which Ghanaians seem to possess in abundance. But up until now it is a sport which has barely penetrated Africa, other than in the far south of the continent. 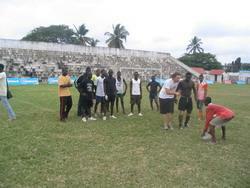 Volunteers in Ghana will have the chance to coach rugby in schools in and around Cape Coast. We are working alongside George Avoola Ladipo, the coach of the Junior National Rugby team, to help develop the sport in the whole Cape Coast Region. George is a qualified coach and is very happy to pass on some of his coaching skills and experience to willing volunteers who are prepared to help him in his quest to bring Rugby to this sports-mad country! Training sessions at the rugby placements can sometimes have as many as 50 children, so any help volunteers can provide George is very welcome. Even if volunteers assist simply with setting up drills and general organisation it will give George the opportunity to focus more on the individual aspects of the game. Once you become more confident you can get more involved in the sport coaching side of things and even lead sessions if you wish. Volunteers working on our rugby project in Ghana will shadow George on a daily basis, helping with all elements of coaching within a selection of schools in the area. You will help with fitness training, ball work, skills sessions and explaining the rules to children who are much more familiar with football! You also assist with the organisation of rugby matches between the various schools and help with the development of a league system. This is a great opportunity for anyone passionate about rugby to get involved in its development in a country where it is in its infancy. You will be able to pass your enthusiasm for Rugby on to a new generation of youngsters and - who knows - in a few years time you may even find that you have been coaching members of the first national Ghanaian Rugby team!